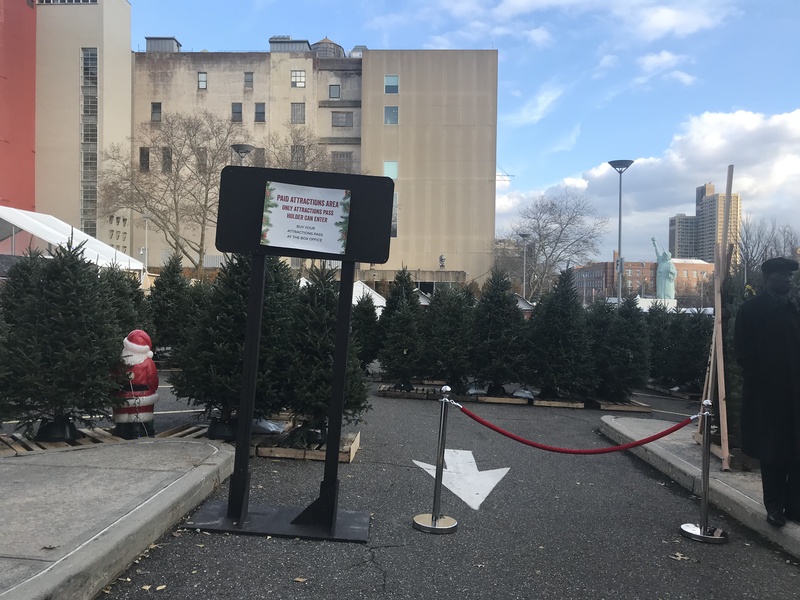 PROSPECT HEIGHTS – A holiday festival that promised to transform a 40,000-square-foot space behind the Brooklyn Museum into an outdoor winter wonderland featuring shopping, entertainment, and activities has left some families feeling disappointed. While Winterfest at the Brooklyn Museum does not charge an admission fee, select attractions will cost you, including Santa Land, “The Chocolate Story and Tasting,” a Snowzilla slide, a giant snow globe, a Christmas tree maze, and wine tastings. 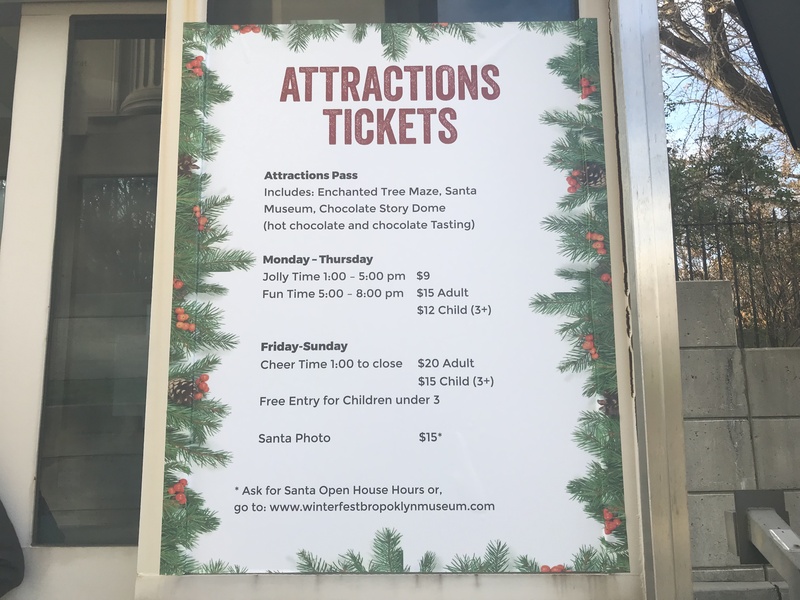 Weekend ticket prices for the family-friendly attractions are $20 for adults and $15 for children and include a photo with Santa, seven chocolate tastings, a cup of hot chocolate, access to the tree maze, and other activities. It was a “disappointing experience,” said one mother on Sunday afternoon, November 25, who drove into Brooklyn from Long Island City with her husband and two young children for the event. 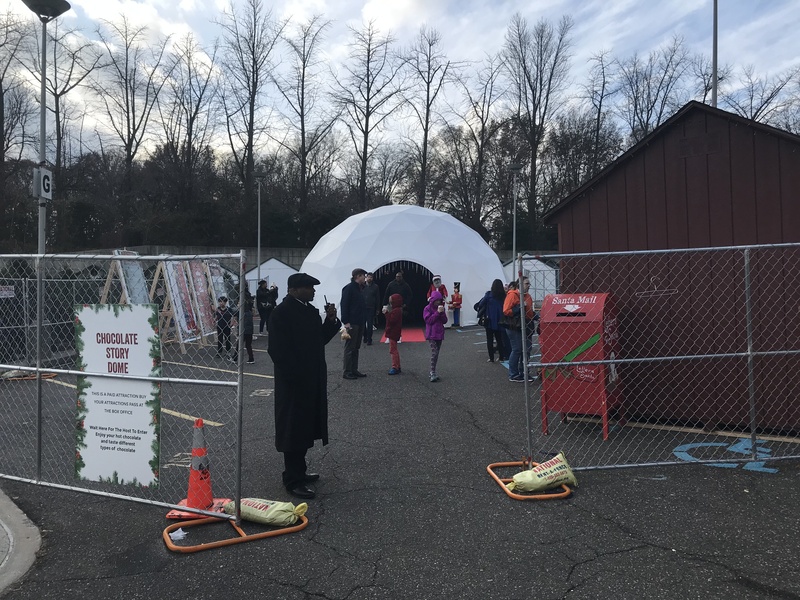 She added that the actual experience was very different from what appears on the Winterfest website saying, “the pictures are far beyond what it was.” Some of the promised attractions, such as the slide and snow globe, were not open during their visit. She noted that she would look into getting a refund since she did not feel her family got what they paid for. Eppie came to Winterfest from Bay Ridge with her 14-year-old nephew Kristian and two other families with small children. She agreed with the previous guest saying that the paid attractions were “not what we expected” based on what she had seen online, noting that she was surprised that the chocolate tasting consisted of Reese’s and Milky Way miniatures and Swiss Miss brand hot chocolate. She also said that the Christmas tree maze was not challenging for the little ones she accompanied who ranged in age from four to nine. “Is this it?” her nephew Kristian asked when he stepped inside the paid attraction area. 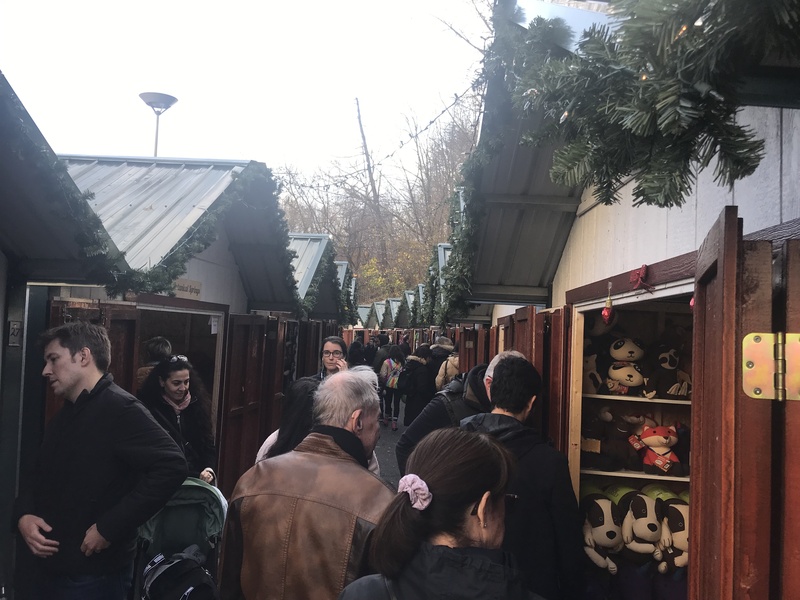 Though he is older than the targeted age group for the section, he told Bklyner, “I thought it was going to be better.” His aunt suggested creating “more of a holiday experience and activities for the kids,” and adding more festive decorations as a way to improve the event. 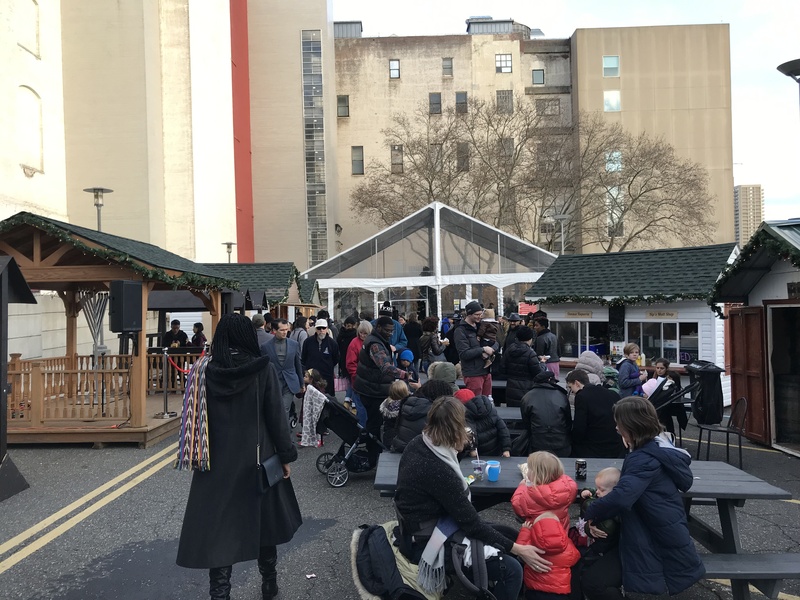 Winterfest is currently operating under a “soft opening right now” and is “improving on a number of things,” says event founder Lena Romanova who has organized similar holiday events in Boston and Las Vegas over the past two years. What works elsewhere “might not work in Brooklyn,” she noted, adding that she is working on tailoring the event more for the community, including more holiday decor and an improved chocolate experience. As for the closed attractions, Romanova explains that the Snowzilla slide had to be nixed because she found out only ten days prior to opening that the city would not issue her a permit for it. Also, due to the Thanksgiving holiday, the snow globe delivery was delayed, but is expected to arrive this week. Romanova told Bklyner that refunds have been given to unhappy customers as well as vouchers for a return visit anytime in December. 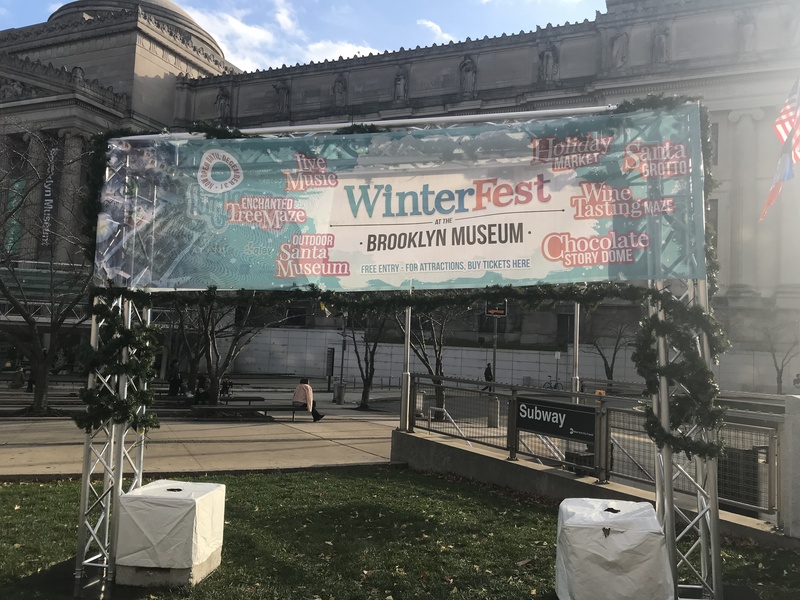 She said visitors who were dissatisfied with the paid attractions during the opening weekend can contact Jennifer Crosby at jennifer@winterfestbrooklynmuseum.com. Originally from Latvia, Romanova’s family has been hosting holiday markets in Eastern Europe for nine years. She says she is taking the negative feedback “personally,” adding, “I want to make people happy.” She promises an improved experience by Tuesday or Wednesday this week when Winterfest reopens to the public. “We want it to be a memorable experience,” she says. I spoke to a manager, asking for a refund when we went on Saturday. She was very nice and asked me to email another manager. I haven’t heard back from this person. My family, including people visiting from out of town, spent $70 total. I’m waiting for my refund. If I receive no response or refund I can’t call this anything but a total scam. Not a poorly thrown together holiday event, but an outright scam. I attended this event and was disappointed that nothing was set up and it was basically false advertising. I contacted Jennifer Crosby several times via email phone and facebook and no response or a refund. I befriended some other folks on facebook with the same complaints and no response or refunds. You can check out their facebook page to see their complaints. I came on Friday with a dated family pack ticket. I spent over $60. Considering the website still advertises the world’s largest snowman and the “Snowzilla” slide I find this entire thing to be intentionally misleading to families. I purchased my tickets on Friday. Had I known that NONE of the attractions (even the maze and chocolate) would be open, I never would have bought them. In other words, they sold tickets KNOWING that the website was offering attractions that would not open ever (slide) and were not open yet (chocolate, maze, snow globe). They were sharing press about the slide days before the event knowing full well they didn’t have a permit. I have called and written twice. The only response I received was, “We will contact you shortly.” That was the entire email. At this point I just want as many families as possible to know about this to prevent people from continuing to purchase these dated “experiences” online. This isn’t about what “Brooklyn likes.” This is about honesty and goodwill during the holiday season. Very sad. Yeah, gonna agree with the above. They had prior knowledge that things were not operational or wouldn’t be permitted, and still advertised it. They intentionally misled customers and need to give out those refunds. My wife and I contacted that Jennifer email, and have yet to receive a response. i’m sooooo excited for the class action lawsuit. Donna Gay (or others): If you have the direct phone number for Jennifer Crosby, that would be appreciated. Sent her an email about the horrendous event as well, requesting a refund, no response yet and want other means of contact. Hi i attended did not buy any paid attractions because there was nothing there, Christmas tree maze was just Christmas trees. I did enjoy the walking around looking into the shops. I enjoyed and tge mull wine and the warm cider for my son. The gentlemen server was kind and considerate. Gosh, I sort of can’t shake the feeling that Angie’s comment may be coming from somebody who represents this winterfest. Oh, btw, in case you’re interested, the woman’s company has run into legal trouble in the past … with a winterfest. Same issue, came specifically for the slide with 4 kids, which were extremely disappointed with this event, it was a total JOKE!! DO NOT ATTEND! unless you want to throw $70 in the garbage. I did receive a refund directly through See Tickets, the company that sold the tickets online. Good luck to all! We are so sorry to hear about your experience at Winterfest. We heard your feedback. Also, we’d like to offer you tickets for a future visit and a glass of mulled wine on us. I was looking forward to go there but looks like I will safe my money. I am sure that people working hard to improve everything but they should stop posting all those fairy tales pictures of the reality tottaly different. I received a refund. Email See Tickets (the ticket seller). They responded immediately. Jennifer @ Winterfest never responded. It’s not just a scam for anyone buying tickets (the website makes it seem like you need them, quite purposely) but it’s also just seriously lame. We went for 30 mins and it was awful. The maze, the wine tasting and all the attractions tbh are a ridiculous joke. Some of the local stalls are nice, of course. But I wouldn’t make a special trip. Go to Bryant Park instead, it feels like a Christmas Wonderland there. From out of town visiting family. Decided to take them and our grandchildren to this “major attraction”. It was pitiful. Had ordered tickets online for 4 adults and 1 child (fortunately the smallest grandchild is too young to remember any of this). Also paid for my granddaughter to have her picture with Santa. So $110 plus tax later I am here to advise you to walk around Dyker Heights or if you want great shopping markets go to Bryant Park. DO NOT SPEND MONEY ON THIS (unless you feel it is part of your penitence and necessary to avoid hell). I never heard back from Jennifer@winterfest, nor did I get a refund. I contacted See tickets and was referred back to the organizers, thereafter I contacted my bank and disputed the charge with hopes that they approve it. Hope you all get your money back! FYI Melanie and Seek Events are no longer associated with this event. Lena fired her and her team. It was mentioned in one the news outlets, I think CBS. I was a vendor at her “Holiday market” in Boston last year and many of the same problems occurred then. Lena is nothing more than a scam artist. 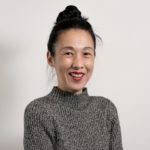 On several occasions she offered us a refund, only to have one of her “business partners” return screaming and berating the women I worked with, reducing one to tears. She ran all of the food stalls, but refused to open them during the week because it wasn’t financially viable for her. What crowds are going to come shop if there is no warm food or drink for them to eat at lunch/dinner time? She is currently being sued by last years sponsors, and I can’t for the life of me figure out why anybody would give this woman another chance. She is knowingly deceptive and knows she does not have the skills or ability to put on an event like this. I hope she gets shut down and loses her business so no other small businesses have to suffer from her incompetence. Sorry for your experience at Winterfest. There is no such a thing as bogus tickets. I understand the effect sought by calling something bogus to claim a refund. The ticket you received form Goldstar include chocolate, candies and mulled wine. I understand from my staff that you used the tickets for that effect. We will investigate further and revert back to you. Meanwhile send me your tickets and please don’t insult us while you are looking for a refund. There was absolutely no intent to insult you Jennifer. Alleging that my intention was using the word bogus to receive a refund is quite insulting considering I am the customer and dissatisfied. Clearly the staff was not clear as to any procedures for this event. Further clarification on this issue as well. At no point were the tickets scanned. No one at the event even knew what to do. And that is feedback. If you are insulted, that is on you. The tickets will be in a subsequent email. As the ticket was purchased from Goldstar, you need to contact them directly. A complete waste of time and a run around! This is ridiculous. If anyone has a Goldstar contact please leave their information. Aside from help@goldstar.com, I haven’t been able to find someone directly to discuss my concerns with.